Back in 1975, Astro Controls started doing business in a small basement in a town called Hoofddorp. Over the last 40 years we grew into one of the most important partners in the Dutch market for machine building and engineering. Besides that, we provide solutions and upgrade possibilities to improve existing machines at end users. We are specialized in upgrading the performance, such as speed, quality and size, or reducing the maintenance interval and therefore the maintenance costs. As years went by, the amount of suppliers that Astro Controls represents has been expended to supply the demands of the market. Our manufacturers are chosen for the highest quality with products that have a technical advantage in comparison to our competitors. Astro Controls’ sales team is technically educated to make sure that we can understand your application the best way possible. This way we can provide the best solution to improve your machine. Our manufacturers are specialized in their own respective area, so you can be sure that we can offer from a wide array of options. They are also willing to look at adjustments for existing products or creating a product from scratch that can provide you with the best solution. Pneumatic components: pneumatic valves, pneumatic cylinders, pneumatic rodless cylinders, grippers, air springs and inflatable elastomeric products. Electric Actuators: electric cylinders with rod, electric rodless cylinders with screw or belt drive. Pneumatic accessories: fittings, pneumatic pressure regulators, pneumatic filters, hoses, flow control valves, etc. Fluid components: micro dosing valves, fluid valves, ball valves, etc. Vacuumcomponents: vacuumvalves, venturi pumps, foam grippers, conveyor pumps and vacuum cups. Shock and vibration isolation: hydraulic shock absorbers, wire ropes, visco elastic dampers and again airsprings. Oil and gas components in Stainless Steel 316: solenoid valves with ATEX certification, safety relief valves, filters, flow control valves, check valves, etc. In 1975 Astro Controls is founded and since that time we created a wide arrange of customers in the automation industry. The experience we build in those years, we take with us to provide the right solution for you. In 2009 there was a management buy-out. Before this we were part of the ITT group, known for instance for producing the Enidine shock absorbers. The employees are very involved with providing you the right solution for your inquiry. 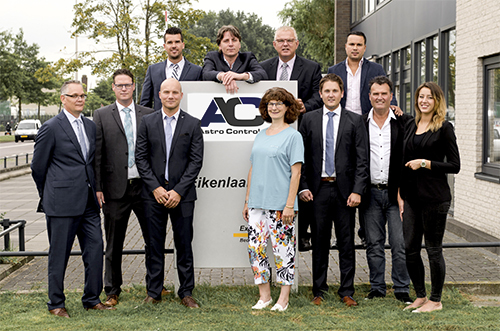 Astro Controls is active at the Dutch market in a lot of industries, this is from big and robust components in the heavy industry, like steel mills, to small and precise components in the semi-conductor industry. If you are nearby and want to discuss a project or a possibility, you are welcome at our office during business hours. If you want to be sure someone is there to help you, please give us a call first. Click here for any open job possibilities.